Australian book characters are beloved by kids all over the country but sometimes forgotten as costumes when Book Week comes along. Let’s make Book Week 2018 all about Australian book characters! Book Week is an exciting part of the school year for kids – especially those who love reading and dressing up! But, let’s face it, parents are busy. It’s often easiest to go for a superhero costume or let your child dress as a Disney Princess if they’ve already got a tiara in the dress up box. But if you talk to your kids about their favourite stories, or which books they’re reading in class, you might find they’re actually full of great ideas for Australian book character costumes. If not, why not take this opportunity to introduce your children to some of our beautiful Aussie classics? Your little one’s favourite Australian book character will make a unique, memorable costume – and put a smile on their little face. That’s our goal! Here are a few Australian children’s book characters that would make great Book Week costumes. Even better, these costumes ideas are brilliantly simple! 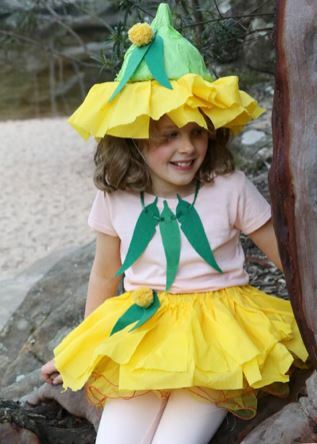 Gumnut Babies by May Gibbs – We’ve created a beautiful costume for your little one. Check out the instructions here! 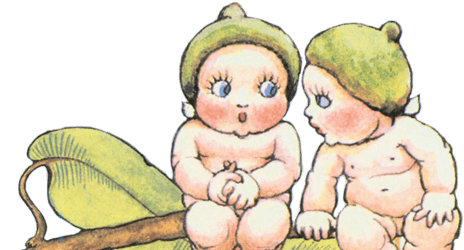 Snugglepot and Cuddlepie by May Gibbs – With a few simple changes to the Gumnut Babies costume, your child can go to Book Week dressed up as any of their favourite May Gibbs characters. Swap the yellow skirt for a green one, or use green or brown coloured shorts, then add a few flowers in their hair. Dot and the Kangaroo by Ethel Pedley – For this simple costume, all you need is a long sleeved white shirt and a yellow dress or overalls to mimic Dot’s distinctive outfit. Your little Dot can take a soft toy kangaroo along with her or him to complete the look! Blinky Bill by Dorothy Wall – To create this costume, you’ll need a white top and red overalls – the classic Blinky outfit used on the cover of many editions of the book. Add some grey leggings or gloves for furry impact. Pop online and print out an easy koala mask, and your child IS Blinky! Storm Boy by Colin Thiele – Dress up your Storm Boy fan in a pair of dark blue shorts, a white collared shirt, and a dark green jumper. Use a soft toy pelican to act as Mr Percival. Grug by Ted Prior – One clever mother designed this great Grug costume for her child. Find an old sheet and cut it into strips. Sew the strips together to create a bag – with one end sealed and the other end open. This will create Grug’s body. Next, cut brown and yellow fleece into strips and sew around the bag from top to bottom to create Grug’s fringy appearance. Cut the fleece into fringes and add felt eyes and a nose. To create Grug’s tree-shaped body, add a hula hoop in at the bottom. Et voila, your Grug costume is complete! For more fantastic ideas to inspire your Book Week costumes, or to read more about the wonderful May Gibbs, check out our fun and games page here! « Gorgeous Gumnut Baby Inspired Birthday Party Ideas!